Squire alleges that the city's bike rental contract didn't go to the lowest bidder. Longtime local cycling entrepreneur Josh Squire has a sorry tale to tell about the city's new plan to put thousands of rental bikes on the streets of Chicago. But Squire, whose Bike Chicago was a competitor for the contract, claims that the bid process was corrupted by insider relationships, and that the deal—which awarded the job to the most expensive bid—will cost the city millions more than it needs to pay. As the plan stands, by the end of the year Alta will have 3,000 bicycles at 300 automated, solar-powered stations around the city. For an annual membership of no more than $85 (or a maximum $7 one-day pass) riders will be able to teeter around in Chicago traffic for an unlimited number of jaunts of up to 30 minutes each. (Except, that is, on the west or far-south sides, where there won't be any docking stations.) The contract with Alta puts the total cost to get those wheels on the street and operate them for the first year at $28 million. On April 26 Bike Chicago filed a protest. Foremost among its complaints: both the head of the city's Department of Transportation and the intern who wrote Chicago's request for proposals had recently worked as consultants for Alta, and the intern is now an Alta employee. Chicago Commissioner of Transportation Gabe Klein collected a $10,000 consulting fee from Alta shortly before his appointment by Mayor Emanuel last spring. Chicago's bike-share request for proposals (RFP) was written by Jeremy Pomp, a CDOT intern who claimed to previously have been an Alta consultant. 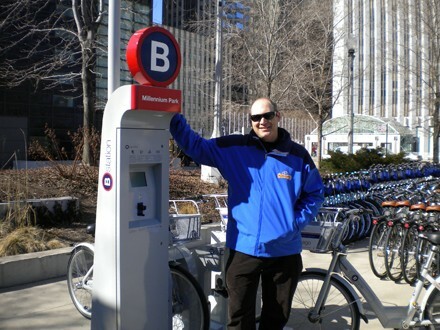 Immediately after the two-month internship, Pomp was hired by Alta as head of its bike-sharing program in Chattanooga. Klein was director of transportation for Washington, D.C., when Alta was given a no-bid contract for a bike-sharing program there. CDOT deputy director Scott Kubly, brought to Chicago by Klein to be his second in command, was also Klein's deputy director in D.C. when Alta got the contract there. Because of his past work with Alta, Klein recused himself from the Chicago bid process, but appointed Kubly, his deputy, to the bid-evaluation committee. The original request for proposals, issued last September, was canceled after its deadline, ostensibly because it needed tweaks. Squire suggests a more important reason may have been that Alta didn't have a Chicago business license when its first bid was submitted, which would have disqualified it. Alta's bid partner, Montreal-based Bixi, a manufacturer of bike-sharing equipment and systems, is struggling with financial and legal problems and is currently up up for sale. Bixi took a bailout worth more than $100 million from the Canadian government last year, and two weeks ago was sued by its software supplier for $26 million. Alta's winning proposal is significantly more expensive than Bike Chicago's. (A third competitor, Tracetel, the U.S. subsidiary of a French company, describes the Alta proposal as "grossly out of proportion . . . to the prevailing commercial market.") Alta's bid for equipment, installation, and start-up costs came in at $21 million; Bike Chicago's was $13 million. "These people came from D.C. and took over CDOT, and they're moving jobs to their friends," Squire alleges. He wants Alta disqualified and thinks the hometown company deserves some respect. The city's bike-rental king and an upstart tour operator have themselves a turf war.